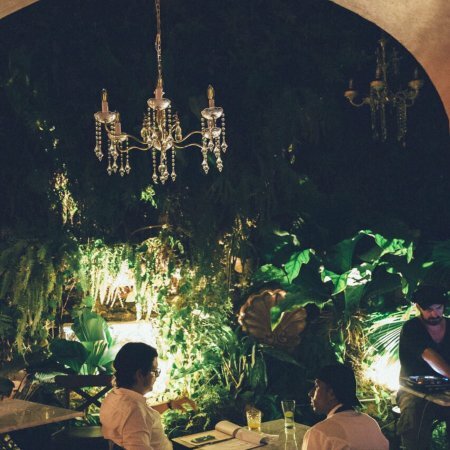 In the town of magic realism, it was only fitting that a bar celebrating the surreal world of “The Green Fairy” should open to delight the tastebuds and muddle the minds of Cartagena’s finest. 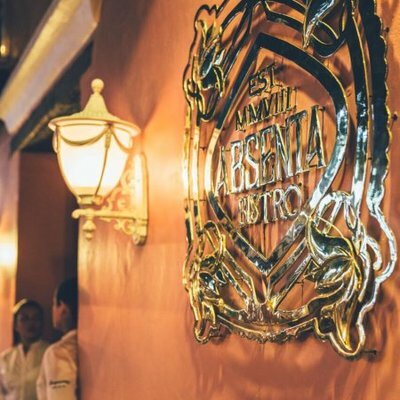 That bar is Absenta; Cartagena’s first establishment dedicated to the famed Absinthe spirit and the art of the bizarre. Nestled in a discreet corner on the buzzing Plaza San Diego, Absenta makes the most of its prime location with French-style cafe seating spilling over the pavement, inviting guests to recall La Belle Époque whilst people-watching the plaza passers-by. Nothing strange about that, right? Inside, however, things take a Dali-esque twist. Cups and sauces suspend from the ceiling, the bar is built of books, the green wall is offset by chandeliers that seem to suspend directly from the stars, there’s melting clocks and wacky house-of-fun-style mirrors distort reality (but then what is really real anyway?). With two other successful locations in Cali, Absenta has already garnered national fame as one of the best cocktail bars in the country (just flip through the gallery slide-show and tell us you’re not getting thirsty) and now we are very happy to see this mixology expertise arriving to La Heroica to shake up the competition. In addition to the trippy absinthe-based cocktails, Absenta does the classics oh-so-well with premium and reserve versions available depending on if you’re a quality not quantity sort. 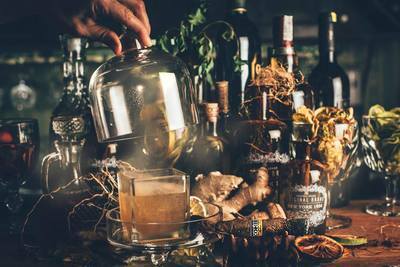 We’ve loved the Lychee Martini, the best Moscow Mule we’ve had in Cartagena, La Veda which comes with smoked cinnamon and tobacco (ooh fancy) and this epic punch that is designed to share between four people. But be careful; it is a well circulated legend that it was after a night of consuming Absinthe that Vincent Van Gough cut off his ear to give to prostitute. Just saying. Food is mostly comfort food with Colombian underpinnings and some French flavour to boot; burgers, stuffed chicken breast, ceviche, steak and chips etc. Their signature dish is a starter called Pavo Manimoto; basically fried balls of turkey crumbed in the popular local crunchy-coated peanut snack Manimoto. Surprisingly moreish. Absenta is designed to be a place to meet with friends straight from a busy day of work or sightseeing. It makes a great place for a pre-dinner apertif (that might turn into you staying for food and cancelling your dinner reservations somewhere else) or the place to enjoy a couple of quality cocktails before really making a night of it. Overall Absenta is a very welcome addition to the Cartagena bar scene and one that is definitely making our hearts grow fonder.